Welcome to this episode of the Real Fast Results podcast! In this episode, we are going to be hearing from Marc Guberti. He is a coauthor of a book called Write and Grow Rich. As you probably know, the makers of this show encourage authors to collaborate with others in their niche, and this book is a good example of how different authors can work together to compile great works. It has been stated that, “Getting rich is a team sport,” and that’s very, very true. Right now, Write and Grow Rich is being pre-launched, and so you can get it for the special price of just $0.99. Plus, there is a special bonus package that you will receive when you purchase it. You can check out this incredible deal at RealFastResults.com/wagr. Well, first of all, thank you for having me on the show to share my insights. So, you have your book that you’ve published recently, or you plan on releasing it soon. One of the best ways to grow your audience, and to get a lot of customers, is by hosting a virtual summit. Today, we are going to learn how to put those two together. 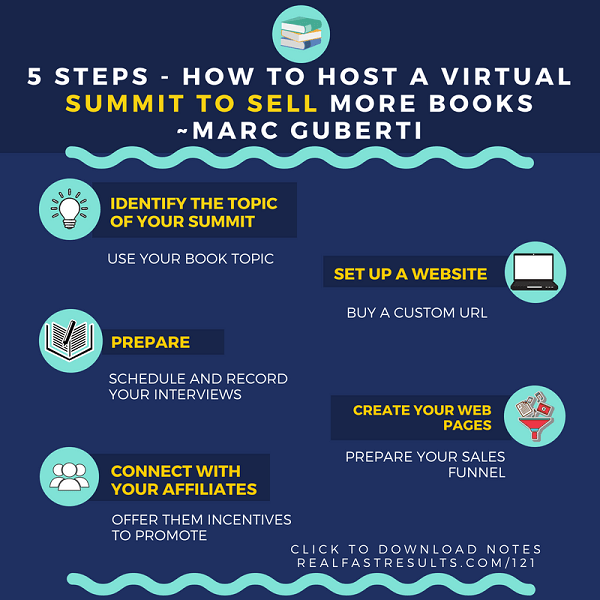 Basically, you are going to find out how to go from reviewing this material to having a virtual summit launch that’s focused on your book, within six months. We’ve talked a lot about summits, and I have two evergreen ones. You’ll find one at ContentMarketingSuccessSummit.com and ProductivityVirtualSummit.com. If you listened to this episode, and you heard how to get your virtual summit up and running, get inside of the summit. Even if you just enroll to be an attendee, just to see how that email structure would work. I strongly recommend that you do that. You should also go check out my podcast, Breakthrough Success, which can be found on iTunes and a bunch of other places.Finally, we talked about my book, Content Marketing Secrets. You can grab that. I’m actually making a “free + shipping” offer, so you can get a big discount. That’s MarcGuberti.com/book, for anyone interested. Don’t forget that Write and Grow Rich is being pre-launched as well, so it’s available for just $0.99. This is a really great book that contains excellent paths, and guides, and blueprints that will help you turn your writing talent into vast amounts of income. You’ll also get extremely valuable bonuses with your purchase if you act now. Again, you can access that by visiting RealFastResults.com/wagr.